East Lake Campground sits at the edge of beautiful East Lake in the caldera of Newberry Volcano. East Lake is one of twin lakes nestled in the caldera of the Newberry National Volcanic Monument, both well-known for their beauty, trout fishing and beaches. Open seasonally, most sites in this campground are on the lake or no more than a few minutes walk away. There are opportunities for bird watching, bicycling, sightseeing, and canoeing. East Lake is a little shadier than the other lakes and is a perfect way to beat the heat of the summer. Visitors can take advantage of boating, kayaking, swimming and fishing on East Lake. 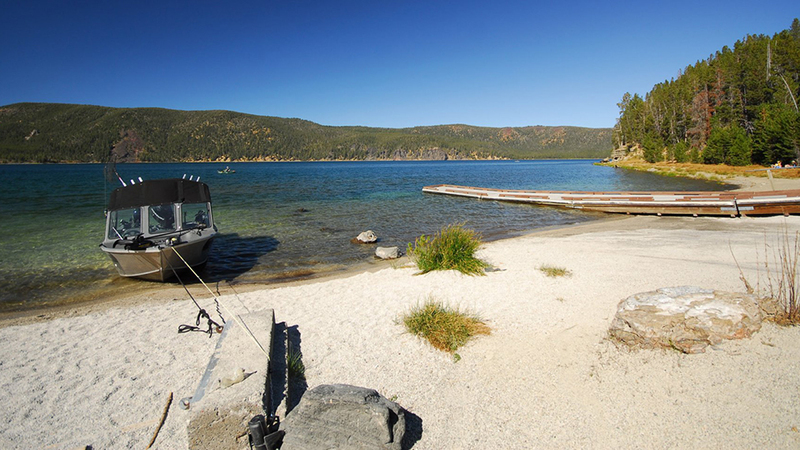 A boat ramp is located in the campground, and the entire facility is perfect for trailer, tent or RV camping. Sites are equipped with tables and campfire rings with grills. Flush toilets and drinking water are also available. East Lake Resort is located close by for food, fishing supplies, and groceries. Sites cost $18 per night and the campground takes reservations online.